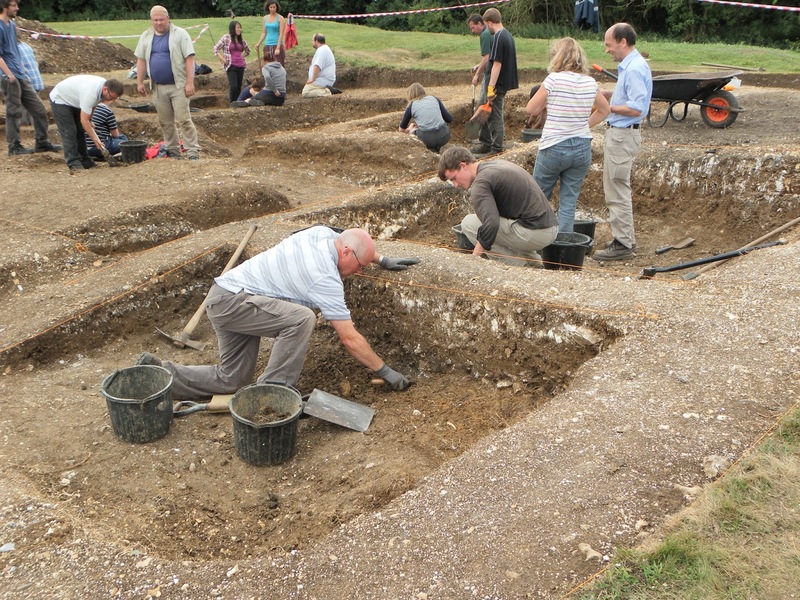 The undergraduates have finished working at Basing House for this Spring, and we’ll be back on site in a few weeks to collect more data for some of our postgraduate students who are using the site for various projects. This is the team from Week 2. I can’t believe how much ground these guys covered! Thanks all! 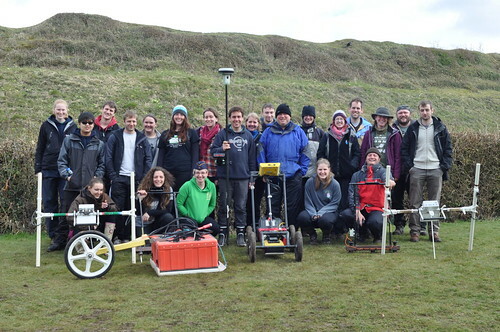 I thought it might be useful to give you a rundown on the different tools that we were using to record the site during the topographic, building and geophysical survey, as we keep saying things like ‘mag’ and ‘GPR’ without explaining what any of them are! In our next post, we’ll begin to share the results of the surveys, so do check back regularly, or subscribe to the blog for updates, using the link on the navigation to the right. 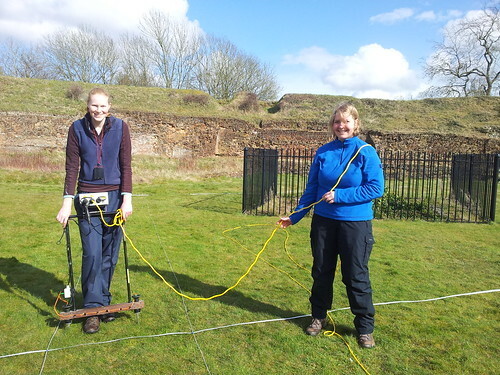 There are a few pieces of kit that we use for a geophysical survey. 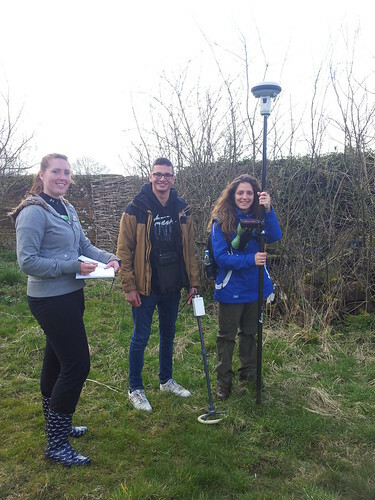 Magnetic survey uses a magnetometer to identify the presence of magnetised iron oxides in the soil. Magnetometers are great for identifying ferrous oxides or burnt/ heated material that show up as ‘positive’ features, as well being great for finding negative features, like a pit or a ditch. Magnetometers are great for identifying industrial areas, and buildings. The magnetometer you see in these photos is a Fluxgate Gradiometer, which is the most commonly used type in the UK. With this instrument, we take two readings at a time. The vertical poles on either end of the horizontal handle are the sensor-sets. Within each of the poles there are two sensors, one at the top and one at the bottom. The reading that we are measuring is the difference between the top sensor and the bottom sensor. The fluxgate sensors are always a set distance apart, normally half a metre or a metre (in this instrument, they are a metre apart). The sensors are very sensitive and so when you are using one, you must be careful not to be wearing anything metal. 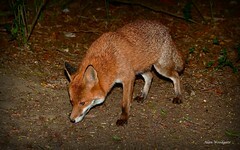 As you can see from the photograph below, this often makes attire a bit unusual. Tracksuit trousers are the best option, and cheap wellies work well for footwear. Belts are an absolute no-no, and raincoats with lots of zips and poppers must be avoided. The higher up your body the metal is, the less likely it is to affect the instrument. So piercings and glasses with metal frames are sometimes okay, but ideally, should be removed. The person operating the instrument will walk up and down in a grid of between 10-30 metres. Each grid is marked out on the ground, normally using bamboo canes placed at intervals (every two metres is a good way to do it), and the person carrying the instrument can use these canes as markers to aim for to ensure their line is aligned correctly within the grid. You can collect the data by walking parallel lines, or in a zigzag shape. Magnetometry – note the poncho – a coat with no metal in it is hard to find! Magnetic susceptibility is possible because material can become temporarily magnetised: Any human activity will affect soil magnetic susceptibility. Ideally what we’re searching for is topsoil that has been affected by features buried underneath it. Magnetic Susceptibility can be collected in continuous or single measurements. The instrument sends out a magnetic pulse, and measures the ability of the soil to hold a magnetic charge. Human activity affects the chemical makeup of the soil, so magnetic susceptibility will be affected by this, and can be used to pick up on things like areas of a settlement where there has been lots of rubbish deposited or farming activity taking place. Resistance survey works by feeding an electric current into the soil. Sub-surface materials all have varying resistivities to an electrical current. With this technique, we measure these values, and in so doing can build up a picture of what is under the surface. Generally walls and other positive features such as trackways, cists, rubble and man-made surfaces result in high resistance, and negative features such as ditches, drains, graves, and pits result in low resistance. This is because negative features tend to have higher moisture content. Depending upon the material and the water content, features can show up as either positive or negative. Typically stone features are high resistance, whereas ditches, depending upon their fill are negative (or low) resistance. The resistance of materials under the ground uses the ability of soil to let electric current pass through it, and this is related to the interstitial water (i.e. water in the gaps in-between) and salts within the soil. On the last day of the survey, we had to abandon the resistance survey because there was the chance of the results being ruined by the heavy rain, and standing water. Ground Penetrating Radar works by firing radar pulses into the ground and recording the speed at which the signals are reflected back to the device. These varying reflections allow a picture to be built up of the sub surface topography. GPR data are recorded in traverses, but are then joined together and sliced to produce flat layers, each layer representing measurements at a particular depth. These layers are known as time slices and can be ‘stacked up’ to provide a 3D model of the subsurface topography. 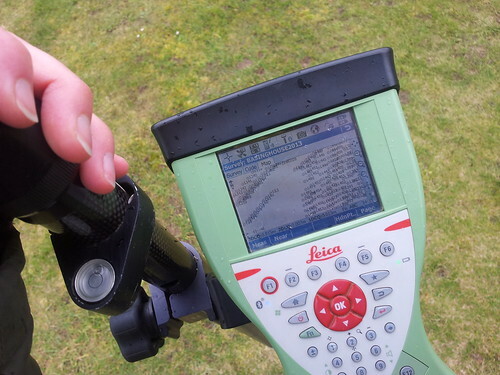 GPR is particularly good at detecting brick or stone foundations and is especially useful as it provides relative depth measurements. 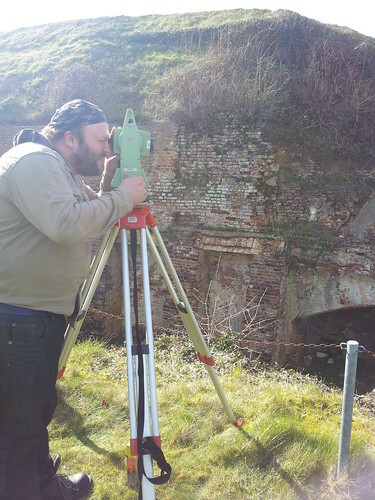 In the photograph above, Dan is using a using a Total Station to carry out a building survey of the Old House. 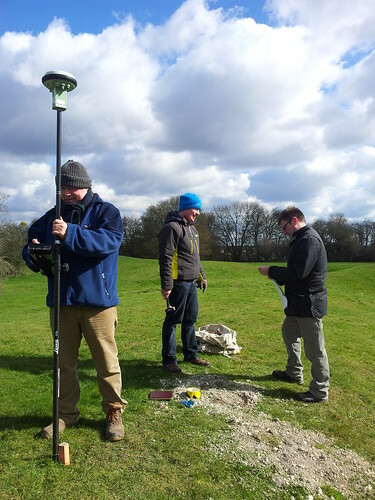 There are two ways to use a Total Station to survey standing remains. The total station is an electronic theodolite, which has an electronic distance meter which measure the distance and angles from the total station to a particular point. A laser is used to make this measurement. 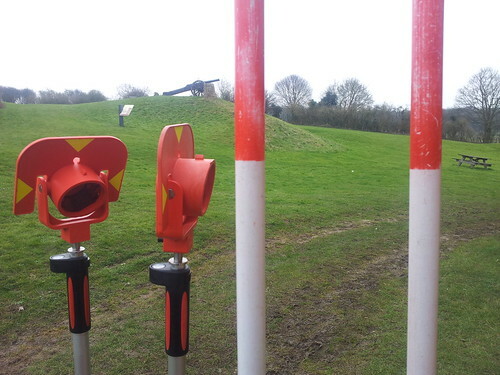 The total station sends out a beam which can either meet the surface that is being recorded, showing up as a red light (as is in the photographs above and below) or can meet with a target in the form of a prism, mounted on a staff of a fixed height. In the first method, the building remains themselves are the target, and point by point the shape of the walls and features are recorded by the total station operator. For the Old House, the teams began with the top and bottom edges of the brickwork, and then surveyed in additional features, such as the bread ovens, doors and window frames. The alternative method, involves using the machine on the tripod as a base station. This is for the recording of changes in landscape. The total station remains in the same place, and a prism (see the photograph below) is used as a target. The prism is moved around the site, and at each point where there is a significant change in topography (or at regular intervals, of around 5 metres) the total station operator matches the laser from the total station to the target prism and records the point. 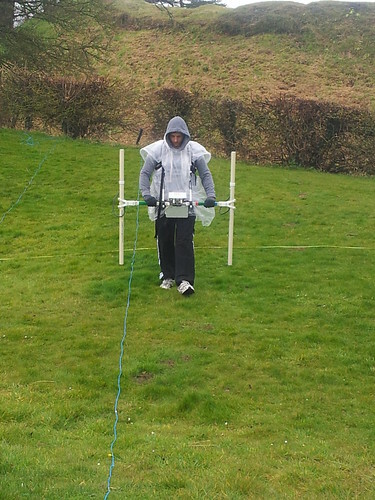 When carrying out a survey on a site the size of Basing House, its good practice to set up base stations across the site. We initially had fourteen base stations, which we added at the beginning of the survey. But the students had to add more, in order to record more problematic areas of the site. For instance, the ditch around the motte and bailey was hard to record without adding lots of stations all of the way round, in order for each base station to ‘see’ back to the previous station, and on to the next one. Below, Dom is using the GPS to log a base station before we began the survey on site. Chris and Tim are adding wooden pegs in the spot that the GPS is recording; this becomes the base station. A GPS uses the NAVSTAR GPS, which is a system which uses a collection of 24 satellites, controlled by the US Department of Defence, which are orbiting the earth. The GPS communicates via a signal with the satellites using a radio receiver, to work out its geographical position – this is possible because the GPS can compute the distance from the satellite by multiplying the velocity with the time the signals take to transmit from the satellite. The more satellites in range of the GPS, the better. 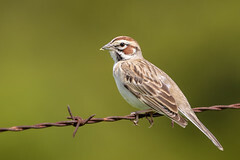 The GPS needs a minimum of three satellites to be able to tell where it is on a horizontal plane, and at least four satellites to calculate where it is 3-dimensionally; i.e. the latitude, the longitude and the height. At Basing House, we used the GPS as described above; as a positioning tool, to tell us where something was; we used it both for the magnetic susceptibility data, and also for adding the base stations. 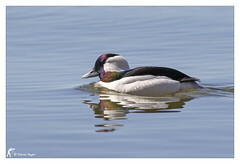 But GPS can also be used as a surveying tool. 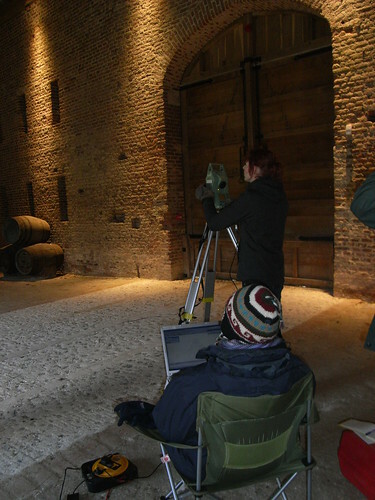 In the photograph above, Lizzie is using the GPS to survey in the gatehouse of the Old House. The GPS can record the location of a series of points, so we used it to fill in gaps of the topographic survey, and the building survey. In the photograph below, you can see some of the points that we recorded up on the Bailey. I walked up and down in a grid, and took points at regular intervals, to build up a record of the topography of the Bailey. I used Gaffney, C., Gater, J. (2006). 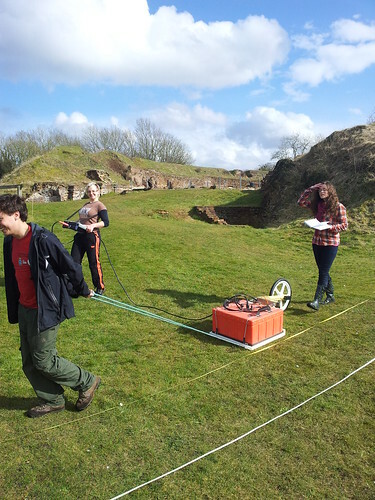 Revealing the Buried Past: Geophysics for Archaeologists, The History Press: Stroud to write this blog post (my geophysics is a bit rusty and I wanted to make sure the iformation was up to date!). I really do recommend this book if you want to find out more about Geophysics prospection for archaeology. 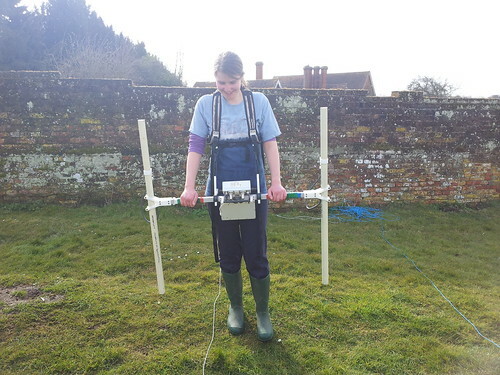 The Archaeological Prospection Service at Southampton (APSS) website – http://www.southampton.ac.uk/archaeology/apss/ – is also a great place to read about geophysics. Kris Strutt writes an excellent blog – http://kdstrutt.wordpress.com/ – which covers some of the work that he does with the APSS, so follow his posts to keep up to date with the projects that the team is involved in. 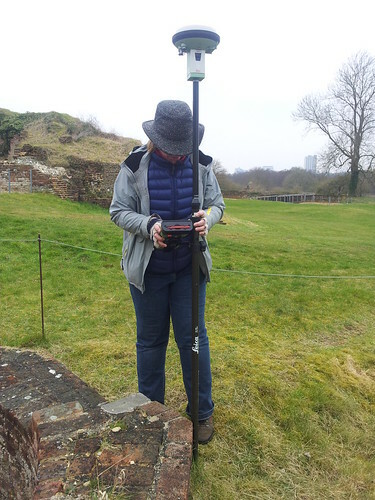 Smashing blog from Nicole Beale on the compoleted survey at Basing House, and a bit of a low-down on the techniques used, represented by abbreviations and three letter acronyms in my blog over the last few weeks. Enjoy!